Annabel, Helen, Woody, Louise and Siobhan. Female carpenter Maggie decides to run a DIY woodwork course, advertised as the ‘Pink Hammer’, from her husband’s man cave. That’s right. You heard me. Sacrilege. Four women pay and turn up. Only, Maggie isn’t there. Her husband Woody is, and he had no idea they were invading his shed kingdom. What to do? This is the cruncher. Woody is understandably grumpy. Annabel wants to build a bookcase, Helen who has a terminal illness wants to make her own coffin, Louise a shed, and Siobhan is just cruising as she sees the course as a vehicle to meet new people and try out something interesting. 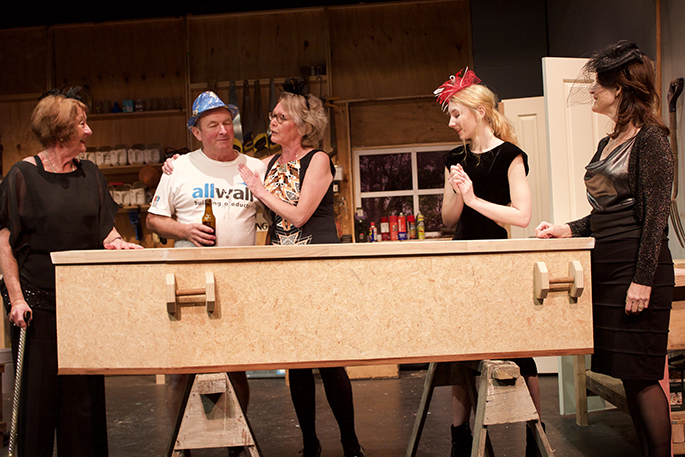 Woody is cajoled then blackmailed into running the workshops, bringing laughs as his sometimes inarticulate emotions are speared by Annabel and tickled by Siobhan. The strong sisterhood is made up of flawed individuals caught in their own emotional or relational difficulties. The DIY is as much about learning off each other to fix personal challenges as it is about building with wood. As the story unfolds over two and a half hours, the humour continues, but we the audience are drawn deeper to the poignant and heartfelt stories of each of the five, touching on themes of abandonment, isolation, lost and broken relationships. The characters are well-developed by a strong cast of Mark Knox, Kayleigh Adams, Sarah Bate, Christine Giddens and Jaine Kirtley. 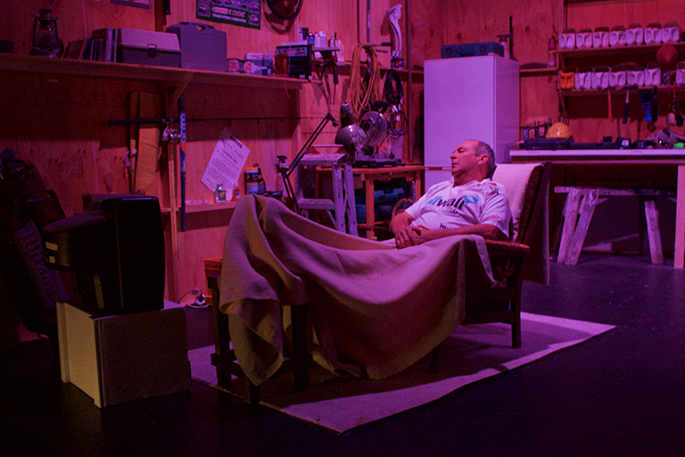 The set, designed by Jeremy Jones, is Woody’s impressive shed complete with beer fridge, sawhorses and tools. Dale Henderson’s lighting design is excellent as always, and operated expertly by Wayne Gould. Written by acclaimed NZ playwright Michele Amas who died last year, and directed by Geraldine Broderick, The Pink Hammer runs until July 1 at 16th Avenue Theatre.